The airphoto above is centered at ~ 81°20' N and 69°0' W, and entirely within Ellesmere Island National Park. For scale, the long axis of the Murray Ice Cap is approximately 5 km. Our camp is just East of the margin. The meteorological stations are designated as follows: G3 is the 3 meter tripod on the Ice Cap (year-round), G10 is the 10 meter tower on the Ice Cap (seasonal, with ventilated radiometers) and T3 is the 3 meter tripod on the tundra (year-round). 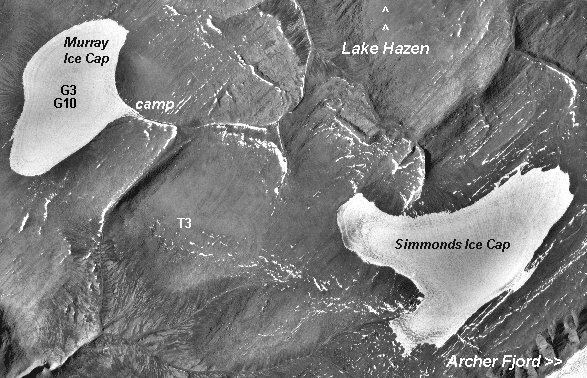 Ablation stake networks have been emplaced on both the Murray and Simmonds Ice Caps. Project Summary - In this project, we are investigating interactions of the land surface, atmospheric processes and snow and ice-covered surfaces over an extensive upland region – the Hazen Plateau of northern Ellesmere Island, Nunavut, Canada where broad, flat hill summits reach elevations of ~750-850m a.s.l.. The area provides an ideal "test-bed" to study the feedbacks and interactions between snow/ice-covered sites and snow-free tundra characteristic of many other regions of the Arctic, without the complications resulting from large topographic and elevation changes.